You have applied to visit your uncle in the UK for 18 days, whilst you have provided some documentation relating to your sponsor in UK, I must take into account your personal and economic circumstances in India when coming to my decision. The starting point for the assessment of any visa application is the information contained in the visa application form and supporting documents.you state that you are a self employed freelance software engineer and earn approximately INR 282,000/year. While you have produced a number of invoices which correspond with deposits to your bank account I note that these funds have all been generated on or after 2 September 2016. There is no indication that you have been generating an income prior to this, despite one of the latter from a client stating that you had been hired by them on a two-year contract from 1 March 2016. I am not satisfied, therefore, that your employment is as stated. While I had submitted payslips for six month from July, contract agreement letter on company letter head and NOC from the same. I also submitted some invoices from other company, shops and persons for whom I worked between September 2016 to January 2017. I also have another two running contracts to make software for them and for these I also submitted agreements. You have stated that further large deposits to your bank account were made following the Indian Government's currency reform, announced on 8 November 2016. Deposits totaling INR 296,824 were credited to your account between 13 November 2016 and 12 January 2017. As you have given an itemized breakdown of the income generated through your stated employment, the provenance of these funds is unclear. 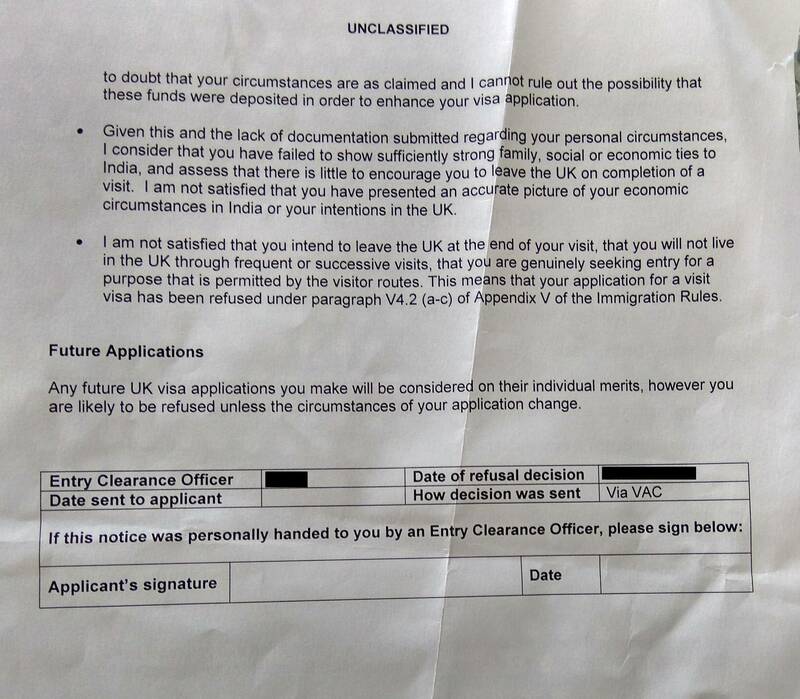 These further causes me to doubt that your circumstances are as claimed and I cannot rule out the possibility that these funds were deposited in order to enhance your visa application. I deposited INR 233,500 which I had cash on hand as per my balance sheet for income tax return of 2015/2016, I clearly mentioned this in covering latter. After all I withdrew all this money before I made January 2017.
given this and lack of documentation submitted regarding your personal circumstances, I consider that you have fail to show sufficiently strong family, Social or economic ties to India, and assess that there is little to encourage you to leave UK completion of a visit. I may not satisfied that you have presented an accurate picture of your economic circumstances in India or your intentions in the UK. Can I reapply right now? This is a classic case of 'funds parking'. The usual reaction to funds parking is to refuse on Appendix V 4.2 (a) + (c) of the rules and this is what happened in your case. Those grounds are something like a coded way of saying that they do not believe you are a genuine visitor and hence you are likely to go underground once you arrive in the UK. They also cited part of Paragraph 320 ("...genuinely seeking entry for a purpose that is permitted by the visitor routes..."). When they start throwing that kind of text into a refusal notice it usually means they got really upset. Although they didn't refuse on P320, I would take this part of your refusal with deep sobriety. Maybe you are innocent; maybe not, it doesn't matter. Deposits in a bank account should be explained and traced back all the way back to where they originated and the onus is on YOU to establish the provenance of your funds. Yes, there is no cooling-off period for a failed visitor application. As soon as you get your passport back from the VFS you can apply on the next day. It's not a great idea in your case because composing and polishing and proofing your explanation will take some time. Rushing in to it invites back-to-back refusals and then matters will be exponentially worse. Note: The term "funds parking" was coined on this site as a metaphor that describes a visa application strategy. "Relaxed", a senior member of the community here gave a definition of the term in this article: What is 'funds parking' in the context of UK visa applications?. There is no point in trying to "Google" the term because it is TSE argot and exists nowhere else. It's etymology as a dodgy practice can be found at Parking. Not the answer you're looking for? 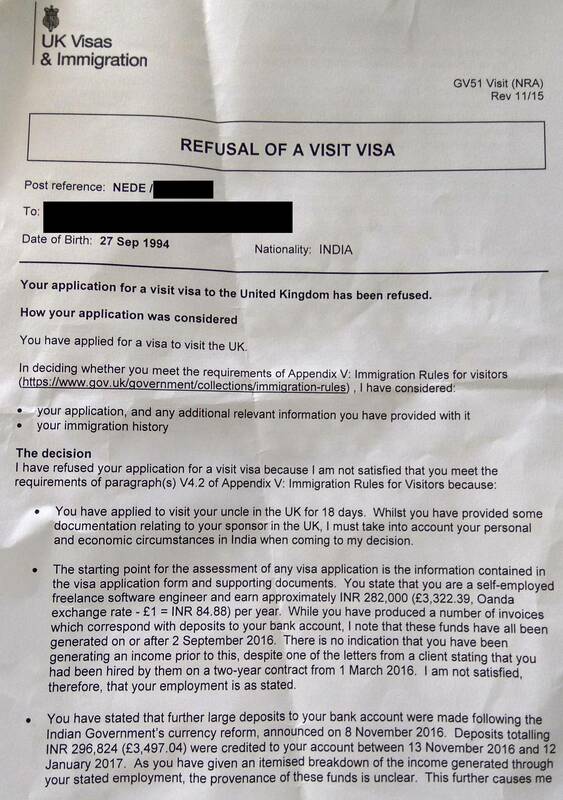 Browse other questions tagged uk indian-citizens visa-refusals proof-provenance-of-funds or ask your own question.